Teaching travel sketching has been my particular passion for more than two decades. In my former life I was a Advertising art director then a gallery owner. Now as a teacher I enjoy taking sketchers from their early moments with a sketchbook and pen to pride and astonishment at the sketching result they achieve. Away from the studios I write, illustrate and video my technique on line (and seem to have gained a considerable social media following). My particular skill lies in the ability to break down into deceptively simple steps the way the eye works with the hand to produce a sketch image. Experienced and new sketchers alike benefit from an improved understanding of seeing and by the use of matching techniques all our tutors use to render an impactful image. I use a particular technique for applying colour which results in vibrant bright images and sketches. Mixed with a letting go more spontaneous approach to image making. This helps sketchers develop their own creative sketching signature. All our tutors have learned these unique skills and you’ll discover the joy of sketching in any of our classes, workshops and Sketch Tours. I love seeing students learning to see the world around them in new ways, learning to translate their everyday observations into sketches that come to reflect their own unique style. My tutoring style is student-centred. I aim to guide students to express their own creativity, sketching in an environment where students feel supported and confidence soars. No judgement, no scores, art for art sake. As a tutor I hadn't anticipated the quiet joy I would feel, seeing others discover their artistic flair or awaken a long dormant creative passion. This is the happy by-product of being a tutor at Erin Hill Studio. Henry Miller said “One’s destination is never a place, but a new way of seeing things” and seeing Manly through the eyes of a group of happy sketchers is time well spent. My background is in Ceramics, Appliqué quilting and Woven recycled fabric art. I also teach of high school Visual Arts and hold a Bachelor of Education Visual Arts. Joining Erin Hill Sketching has it has reignited my passion for sketching on the go and has enabled a sense of community with other enjoyers of food, travel and art. I look forward to new friendships and sharing the accessible techniques of EHS to sketch anywhere … and revealing the mysteries of colour. I am passionate about learning and education, specifically art. 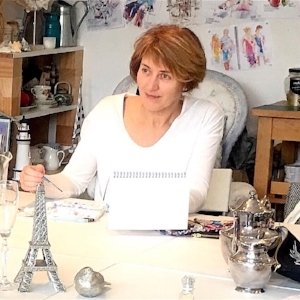 I have completed an extensive range of courses, since qualifying as a high school teacher leading me to teach in Textile and Design and Food Science and watercolour. My interest in creating edible art sculptures led me to further study where I received an Advanced Certificate in Fashion Retail (TAFE). I love sharing my knowledge with students. My goal is to know that each student feels empowered with their sketching skills as well as confident within themselves. I have always enjoyed all aspects of design and colour through working as an interior designer, in magazine publishing and at the Royal Botanic Gardens Sydney. Tutoring gives me the chance to guide others to see the world in a different way and to have the confidence to express that through their sketching in a relaxed environment. It’s a pleasure to share ideas about art, travel and other passions with students and to support each other in the practice of “sketching in the moment, for our own enjoyment”. I look forward to meeting you soon. I’m delighted to introduce myself as one of ErinHill Sketching’s passionate sketch tutors. I’ve always been creative and since coming into the world of Travel Sketching, firstly through classes with EHS and then graduating to tutoring, I’m so enjoy seeing you discovering a similar journey, and that ‘Yes, you can sketch’. Whether you want to sketch your everyday life or bucket list travel destinations, I will guide you to success using the special ErinHill techniques. My own sketching style is fast, loose, expressive and usually explodes with colour, however, you will discover your own unique style that will be encouraged and developed. Your sketching will become your story. Wherever you are, you’ll have a journal filled with wonderful unforgettable memories. Lets get started. The World is Your Studio!!! Like all Erin’s tutors, I’ve drawn/sketched all my life and for me, sketching is a way to understand what I’m looking at. I’ve worked as an animator and have studied Fine Art, but when I did my first class with EHS, I felt like I was being TAUGHT for the first time. When it comes to teaching others, I particularly enjoy helping each student to work through any challenges they feel they have. My speciality is teaching people who are hard-of-hearing, and I’m really excited to be offering Auslan Sketching classes to Deaf people soon. Looking forward to meeting you in one of my classes. Being a sketcher and an EHS tutor is a privilege. As a sketcher its a privilege to have the ability to bring something to life on a page. As a tutor its a privilege enabling students to realise that they CAN create amazing sketches they previously never dreamed possible, and have fun doing it with others ! It was a dream of mine to move from the UK to the south of France and pursue a more creative life. In 2008 I was lucky enough to be able to do that and the Languedoc is now my home. As a tutor I help people overcome their fear of 'the blank page' and achieve something they never thought they could. My workshops and sketching holidays are designed for those looking to develop their drawing and painting skills whilst exploring some wonderful locations. I’m loving my life as a tutor with EHSketching Melbourne. Who wouldn’t love sketching, travel, and meeting lovely like minded people. I hope to inspire you by sharing my own creativity with you in my classes. I encourage you to discover that you can sketch and then paint with watercolour. With these skills comes the invaluable gift of seeing the world as an artist and enjoying your life more . The world is more meaningful and richer by paying attention to the beauty of everyday. You’ll learn in a supportive, caring way where you focus on developing your own individual artistic style. Start your creative journey today.